This RSIN guy is like buses, waiting ages for one custom and then two come along at once! Following his custom mini series of Janky this week (read HERE), RSIN also has another new release, this time a collaboration piece with our favourite American uncle – Uncle Studio! Both artists working on this 7″ Coarse Omen in a piece titled ‘Stardust’. 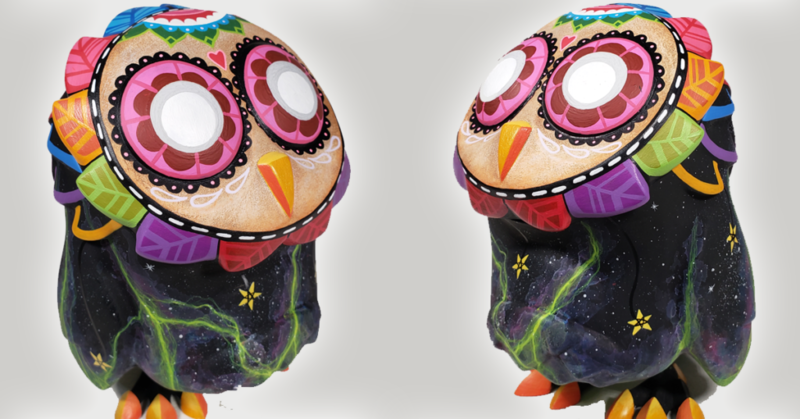 Uncle Studio worked his nebula style paint job to the body before Rsin painted the Omen face, did the multicolour feathers, bold colour outlines on the back and then added hanging stars and a crescent moon. RSIN also added spot gloss on the matte body. A beautiful custom collaboration 10 years in the making! Stardust is available to purchase now from RSIN’s Whispers of the Dead online store HERE. Priced at $400 (£311). This is a one-of-one custom, so don’t miss out. Tags: 7 • coarse • coarse toys • collaboration • custom • Omen • rsin • Stardust • Uncle Studio.